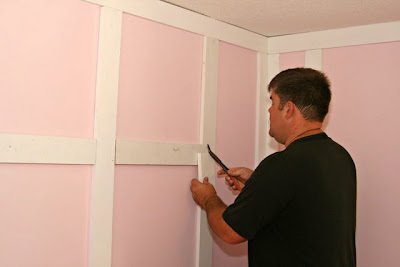 Blackberry House blog retail shop projects and painted furniture: What's Pink and White and Blessed All Over? 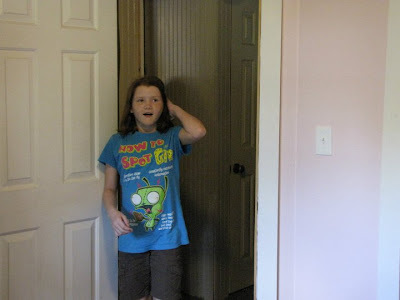 An Awesome Makeover for a 12 Year Old Sweetheart, that's what! 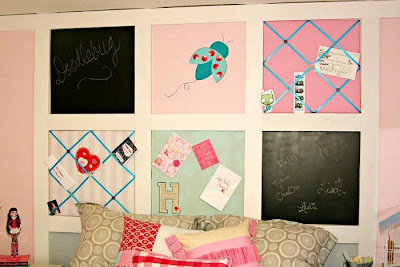 Move over Pottery Barn Teen, DIY bloggers are on the loose, and you've got nothing on us! Well folks, the makeovers at The Shabby Creek Cottage are finally over, and I'm tickled pink to show you how they turned out. 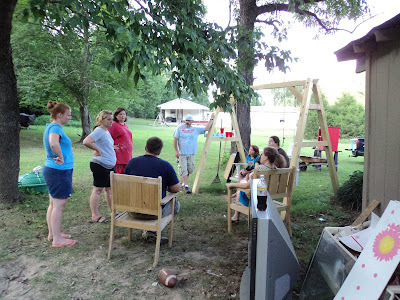 I don't think there is any one DIY thing we did NOT do in the few days we converged on the cottage down in the boondocks at Gina's. We painted, thrifted (in the shop), built, designed, decorated, sewed, fluffed, staged, messed up, cleaned up, ate, laughed, and got injured. All part of the DIY process I suppose. Now let's hop to it! .....and it makes all the hard work worth it. "It takes a village", or so they say, "to raise a child". Well let me tell you something, it also takes a village to recreate their rooms in the blink of an eye! and Deneen of Living in Color, who was there the day before I got there. There's so much to cover in this one little room that all of us are breaking it down into parts. 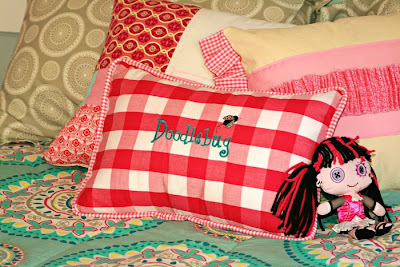 I'll be telling you a little about the pillows we created for Doodlebug's room in a minute,but before I do, here's where you can find all of the other project discussions. 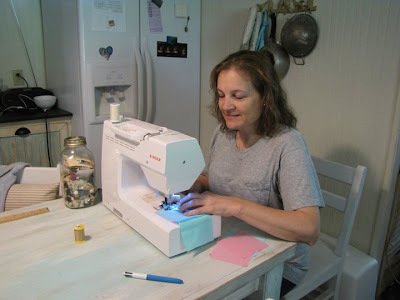 Cha Cha had her hands in a bit of everything, but she's going to be telling you all about how to make couture clothing from curtains and lamps. And might I add, Cha Cha is about the cutest thing you ever will meet. 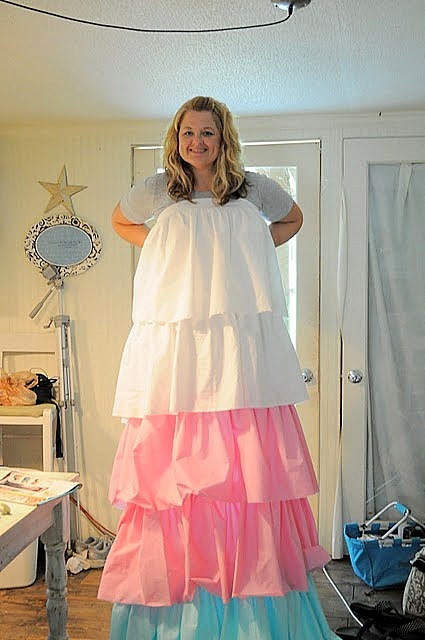 Give that woman a pile of scrap fabrics and you never know what brilliant creation you're going to end up with. She went on a flower making frenzy that impressed us all. And the curtain tiebacks (that you haven't seen yet) were SUPER! Lisa will be telling you about the abso-tootalutely fantabolous headboard wall. "That gal has tools and she knows how to use them." Now I dare you to tell me WHO in all of blogland has a cuter, more fabulous headboard than this. It is very dramatic in person. Lisa is a quick thinking, problem solving, picture in your head bringer to life kinda DIYer. Cha Cha's husband Jeremy did his own fair share of work. He moved from one thing to the next every single day. 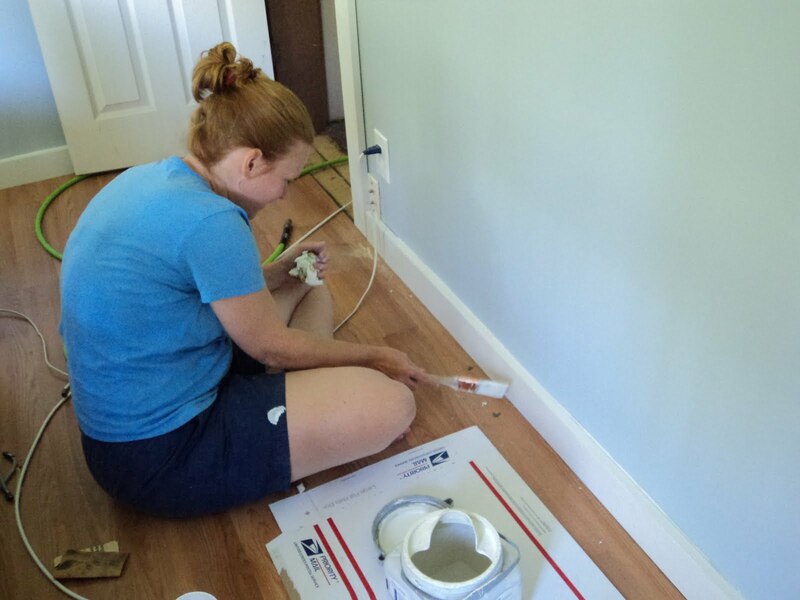 Angie did a lot of the grunt work, like painting and caulking, and message board making. She's a hard worker. No doubt about that. She'll tell you about the message boards and bench in her first post. Sweeter than sweet should be allowed to be, she's a red headed smiley face beauty with a daughter that is her exact double. Darling family. Oh yeah, she has lots of thrifting stash too, and she came bearing some great loot that I'm sure will be showing in the form of projects on all our blogs. Leslie, who won the contest to come to the cottage, was my partner in crime. I don't think she saw daylight again.......but I think she's still talking to me anyway. She'll tell you about the bookshelves and other stuff over on her blog. Then of course there's Gina and Mr. SCC, who did just about everything else. 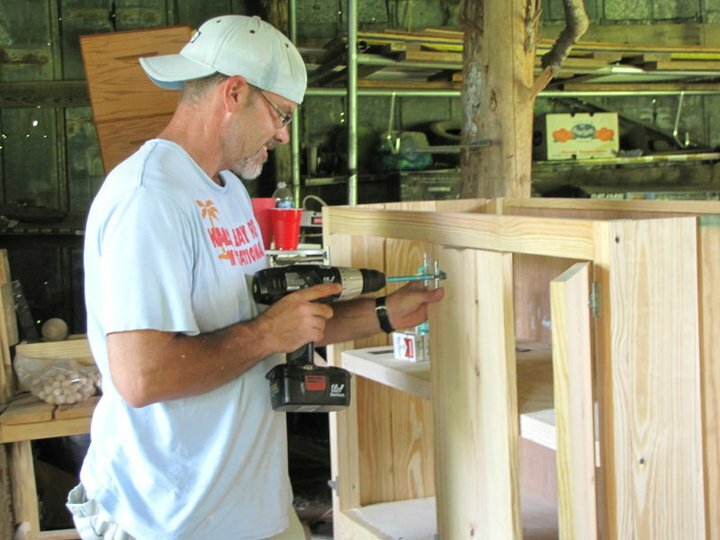 The pre-planning, floors, walls, cutting, sanding, building, painting, execution of projects, feeding everybody, etc, etc. Mr. SCC is about the quickest builder I have ever seen. I told him he should consider opening a roadside furniture shop where customers could put in their orders, go get lunch, and then come back and pick it up. He's in the wrong business for sure. He needs to be selling "furniture while you wait". It was hard to get pics of her because she was busy going from one project to another, all day, every day. I'm still searching everybody's uploads to find some pics of her doing her thang. And that brings me to me. I did work, pinkie swear. Just ask Leslie. 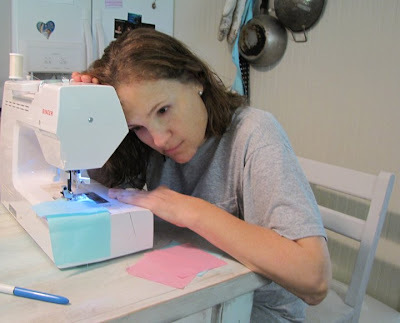 She may tell you I wouldn't let her up from her sewing chair though, so maybe you shouldn't ask her after all. Leslie and I decided to do all the sewing, except for the curtains because Cha Cha wanted to tackle that. Glad she did because they turned out awesome. Leslie and I both understand the delicacies of working with a child when it comes to decor. They want what they want, problem is, they often don't know what that is until they see it. And, they often want change, but fear it at the same time. It's the fear of the unknown. Kids are visual, so we knew we had to keep Hannah included in the decisions. We layed out every pillow and let her decide if she liked it or didn't before we sewed anyting together, and I'm glad we did because she ended p with exactly what she wanted. And, we discovered, she's pretty cotton-picking good at selecting fabric combinations. 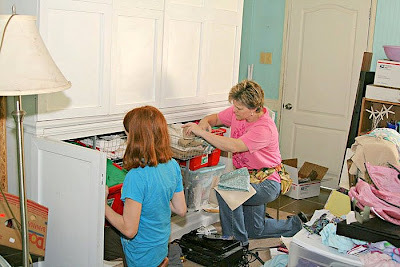 We came up with a few from Gina's craft cabinet, but we also raided my car. Funny thing is, I keep a lot of fabric in my car for emergencies. Yes I do. We found some great selections to work with. 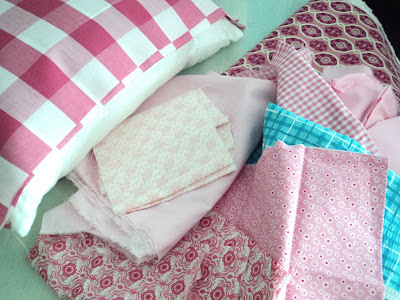 Theses fabrics ended up in her pillows, tiebacks, Cha Cha's flower pins, on her bench, and on her wall. After a lot of selection, planning, prepping, and sewing, here's what we ended up with. 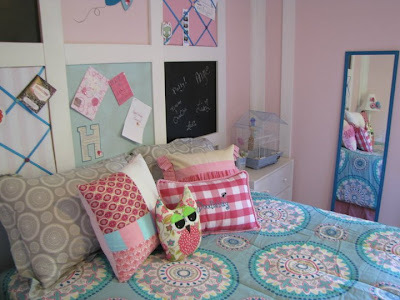 Since Hannah's bedding was already colorful, and had plenty of aqua in it, we thought pulling a selection of primarily pink fabrics in the pillows was the way to go. In the beginning, Hannah didn't really want a lot of pink. However, after laying them out one at a time and letting her move the fabrics around, she discovered she liked it afterall. The large pink check she didn't really care for initially, ended up being a bit hit after the fact. Lisa jazzed it up with a Doodlebug design that's too cute for words, and she'll tell you about that on her blog. Making great pillows is all about your fabric selection, not necessarily all about the design. You can make a fantastic pillow with a few scraps. 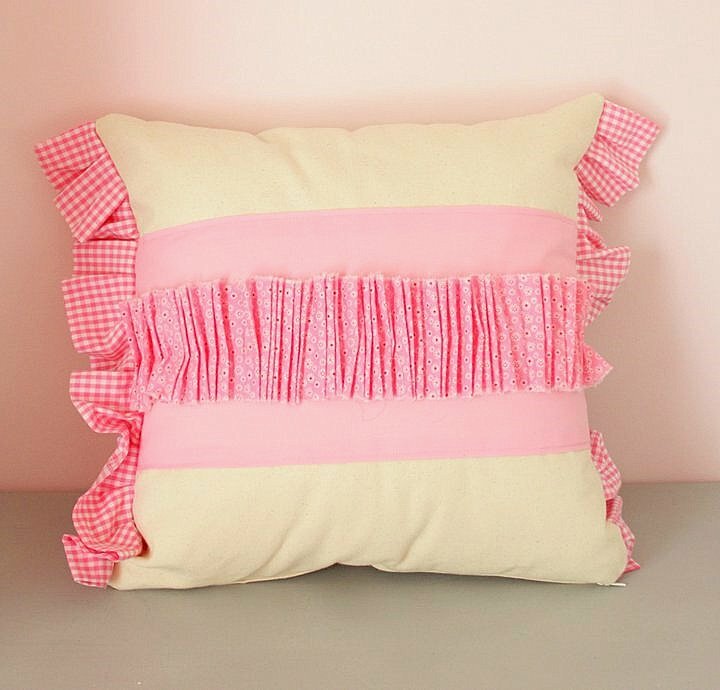 And when you're making a collection of pillows, keeping them simple but different ususally makes for a winning combination. When deciding on Hannah's color and fabric combinations, we knew she would be flipping her comforter over to the gray side for everyday use. The pink definitely had more drama on the gray than the aqua fabrics we had, so pink it was. 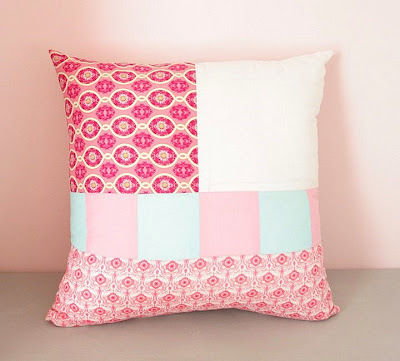 She wanted simple pillows without a lot of busy color. I think we came up some good ones. What do you think? They're simple, neutral yet colorful, and blend nicely with the comforter and shams, as well as the other colors and elements in the room. 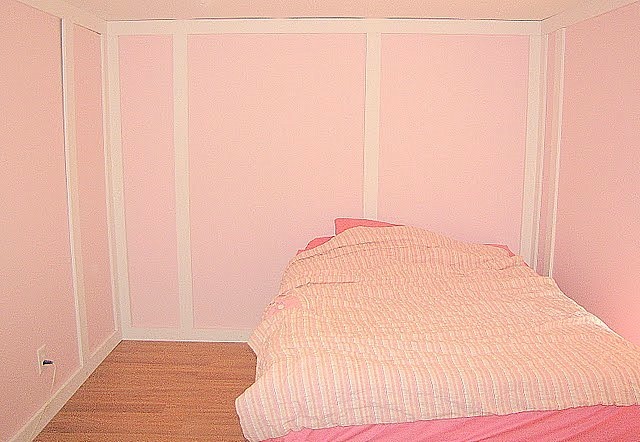 They stand out against the headboard and shams, yet they don't make it appear busier than it should. She loves them and that's all that mattered to us. Gina found this pillow at The Artsy Chick Show a few weeks back. I'm not sure of the vendor, but I'll find out and let you know. Isn't it darling? It was the icing on the pillow cake. All in all, we had a wonderful time getting these rooms completed. There was a lot of "Let's do this". "how about this", "what if we change it up this way", kinda stuff going on with every one of us gals and guys, but it's all that brainstorming and bouncing of ideas that made it such a success. 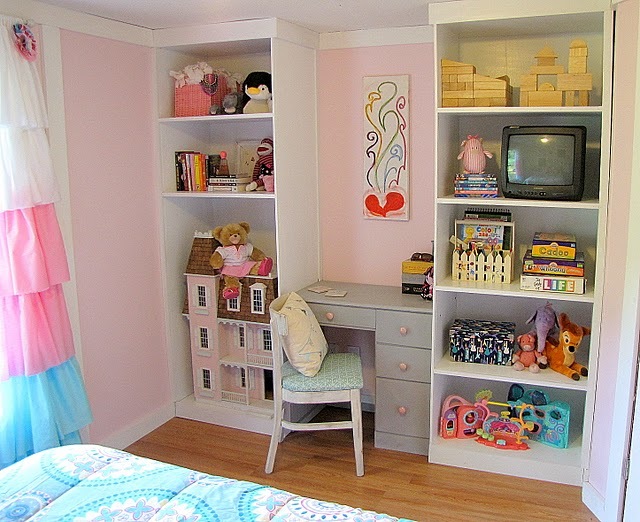 Scroll back a up and visit all the other blogs for the complete synopsis of the Hannah's room. It's hard to pick a favorite room because they're both so perfect. But just to give you an idea of Lauren's room, we wanted her to feel like she was living in her own art studio - and she does! Wait till you see it! It sure looks like alot of fun, hard work. What a great idea to have a productive get together. I'd love to know the vendor for the owl. Any idea where the bedding came from. The overal room is adorable. Love Doodlebugs' face. Do I see a ball and chain on Leslie's ankle attached to that chair, Polly? : ) You all did a great job and I know that sometimes it can be difficult when there are too many cooks in the kitchen, but it sounds like everything went well and the mission was accomplished! Oh my goodness...I'm tired all over again from reading your post. LOL! I love getting your viewpoint on the whole weekend. I didn't know that you and Leslie stayed up talking in the wee hours when the rest of us were getting out beauty sleep. Your emergency stash saved the day and it taught me an important lesson....always carry fabric in my car. 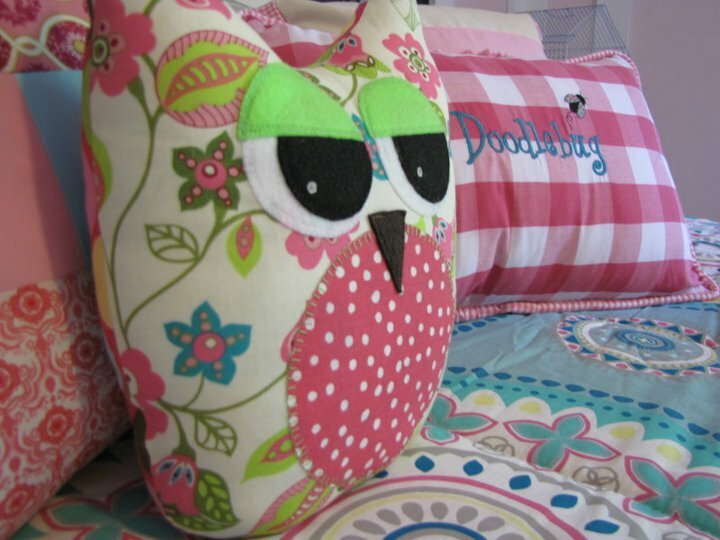 Wow Love the pillows!!!! Thanks for the shout out! It's Dreaming in Color! lol You all are so creative! You girls and guys did a fantastic job!!! How very creative you all were and merging all your talents together to make a dream room come true for this little girl was so loving, kind and generous. So pretty, I know she loved it ! Did you make the slip for the bench too ? That is super cute. 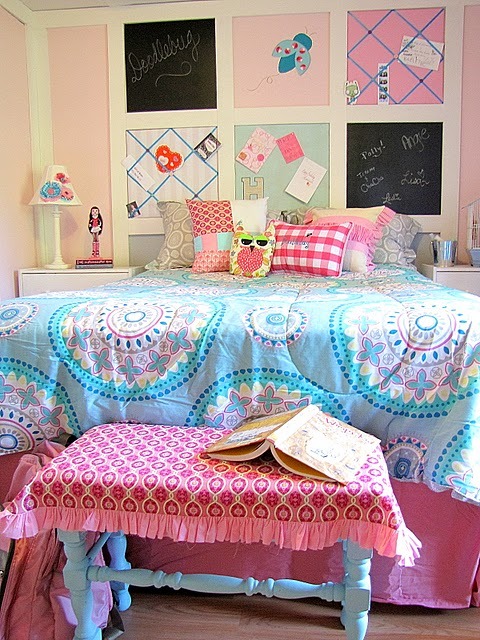 Wow, this looks like a PB catalogue bedroom! Beautiful. I like the mix of aqua and pink. Stopping by from Today's Creative Blog. I loved loved loved staying up with you till the wee hours and chatting. 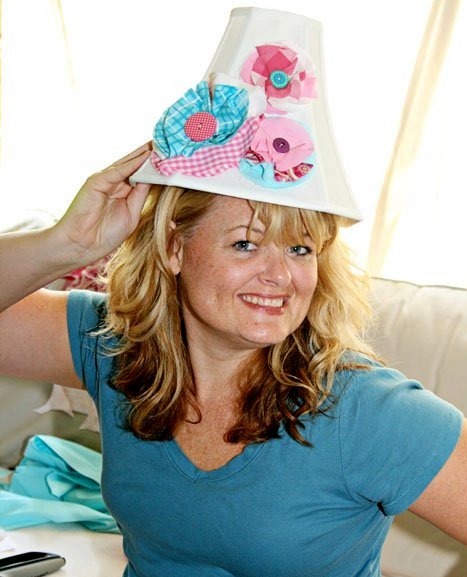 And I learned so much from you about sewing and loving and life!! This was a super-cute post and I just today I stopped limping from the injuries I received from the ball and chain! See you on Friday, love! 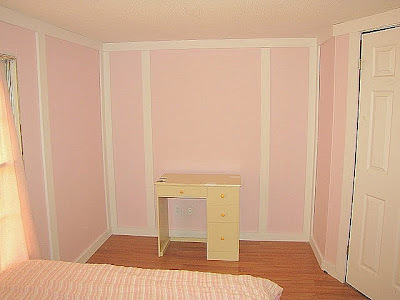 Polly, this room is adorable. What fun to be able to work with such talented ladies! Gina's daughter's expression is just priceless! All the hard work was worth it. Wow! What a great makeover. That must have been so much fun. I would have loved being your sewer. There was so much talent there among your group. Yes, I'm sure you were all tired (I got tired just reading about it). But you must have felt so rewarded by the results. Pillows are kinda my thing and I love all the ones you made. The owl is so cute. Glad to see you posting again. Can't wait to find out about your house.